Highlighting the work of some other Aussie Street Photographers has been a blast. 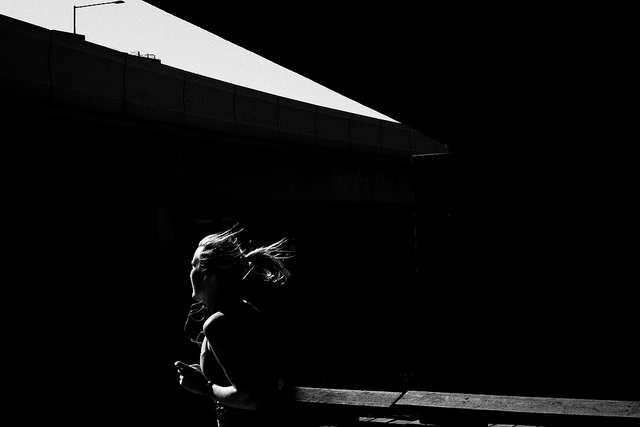 Cameron Delaney is the latest to share his work with Melbourne Street Photography. Cameron is based in the Byron Shire, New South Wales, about 50 kms south from the Queensland border. A tough place to be a street photographer… Limited locations! Let’s find out a bit more about Cameron. I like people a lot more when I’m photographing the street, I smile, speak and even have the odd conversation which I would never do if I was just passing through the streets in everyday life. Also the fact that I don’t live in a large city means I have to go to those areas (Brisbane & Surfers Paradise) just for the purposes of taking photographs, which forces me to see the city with its buildings, roads, cars and people all as one. I sometimes carry a Canon Kiss X4 with a 50mm. I have to repeat this to myself a lot. What’s your favourite “go to” spot? Wherever there are people, buildings and light. What got you into Street Photography? Truthfully it was looking at and following great photographers on Tumblr. 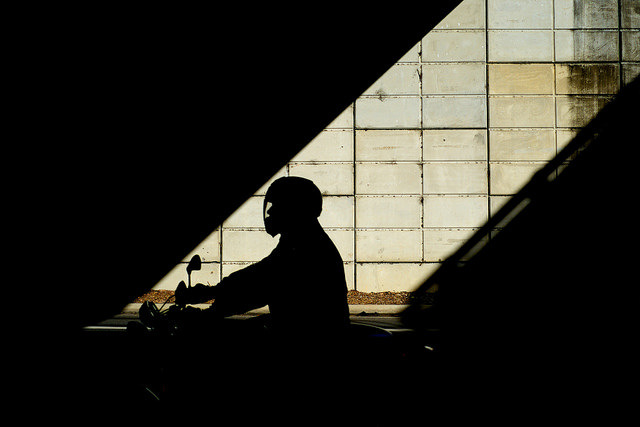 The images I liked and gravitated towards tended to be predominately street photography & urban environment. A friend at work is also passionate about photography so we started going for walks, driving to different towns. I started a separate picture only blog on Tumblr and even now like to upload at least once a day. Before long I realised I was hooked and have been fumbling,cursing and giving up ever since. Cameron’s images are a pleasure to curate and think about. Let’s get the obligatory colour shot out of the way first. Cameron has a great feel for colour and how to use them for the greatest impact. The clear blocks of colour in the image are both striking and evocative. The bisecting line of the gutter gives both of the main colours space to breathe and live separately. 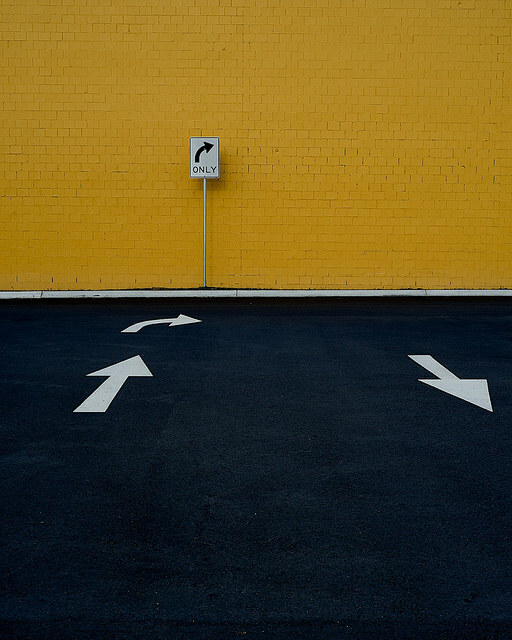 The arrows provide a natural path for the viewer’s eye to travel, and is a little bit quirky and playful in the way the eye travels up the wall and then back down to the ground. Nicely spotted! Focus is over-rated, as the saying goes. Three is always a good number in street photography. It is always seems to deliver a dynamic feel and motion to an image. The three subjects in the image form a bit of a gestalt triangle shape, which is aesthetically pleasing. 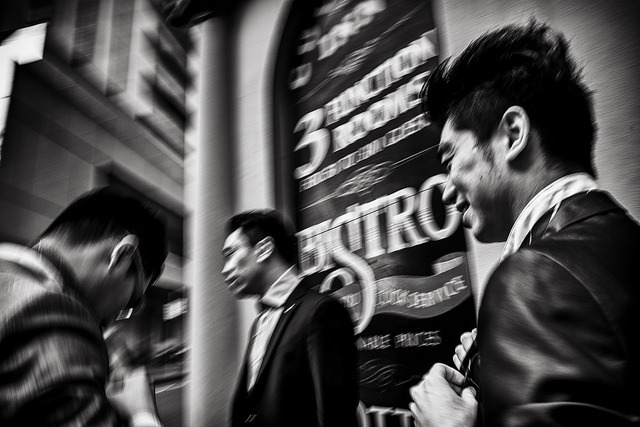 The lack of focus also adds to the feeling of fluidity and movement in the image. The subjects feel as though they are in motion. The next two images demonstrate the excellent mastery of light that Cameron has. Understanding how light and shadow work together to create great images is something that is worth working on! Not everything in an image needs to be lit – sometimes by having dark, negative spaces, it can highlight the subject even more. In the first image, the edge lighting on the subject is very appealing, and adds to the her sense of momentum. The runner’s hair flapping back in the wind is only partially visible. The light only hitting in a way that highlights her hair, rather than illuminating it. I think I would also like to see this image cropped a bit to take out the source of the light at the top of frame and just leave her and the road markings. Maybe in a panoramic style crop? The second shows an awareness of the opportunities that only experience helps you see. Seeing the sliver of light and then waiting for the right subject to present itself is part of Cameron’s mantra and is perfect in this image. Cameron’s tip is a very useful one for street photographers. Find a canvas and wait for the paint – but please try and do this without looking creepy for all of our sakes’! Cameron has recently acquired gear to process and print film – I am very much looking forward to hearing how he goes… I love the process of shooting film, and hope Cameron does too. To wrap things up, Cameron also shared with me a personal inspiration of his – a letter written by Magnum photographer Sergio Larrain in 1982 to his nephew, who had asked Larrain for advice on how to become a photographer. Enjoy. First and foremost, find a camera that fits you well, one that you like, because it’s about feeling comfortable with what you have in your hands: the equipment is key to any profession, and it should have nothing more than the strictly necessary features. Act like you’re going on an adventure, like a sailing a boat: drop the sails. Go to Valparaiso or Chiloè, be in the street all day long, wander and wander in unknown places, sit under a tree when you’re tired, buy a banana or some bread and get on the first train, go wherever you like, and look, draw a bit, look. Get away from the things you know, get closer to those you don’t know, go from one place to the other, places you like. Then, you’ll start finding things, images will be forming into your head, consider them as apparitions. When you get back home, develop, print and start looking at what you’ve done, all of the fish you’ve caught. Print your photos and tape them to a wall. Look at them. Play around with the L, cropping and framing, and you will learn about composition and geometry. Enlarge what you frame and leave it on the wall. By looking, you will learn to see. When you agree that a photograph is not good, throw it out. Tape the best ones higher on the wall, and eventually look at those only (keeping the not-so-good one gets you used to not-so-goodness). Save the good ones, but throw everything else away, because the psyche retains everything you keep. Then use your time to do other things, and don’t worry about it. Start studying the work of others and looking for something good in whatever comes into your hands: books, magazines, etc. and keep the best ones, and cut them out if you can, keep the good things and tape them to the wall next to yours, and if you can’t cut them out, open the book or magazine at the good pages and leave it open. Leave it there for weeks, months, until it speaks to you: it takes time to see, but the secret will slowly reveal itself, and eventually you will see what is good and the essence of everything. Go on with your life, draw a bit, take a walk, but don’t force yourself to take photographs: this kills the poetry, the life in it gets sick. It would be like forcing love or a friendship: you can’t do it. Take a new journey: go to Porto Aguire, ride down the Baker to the storms in Aysén; Valparaiso is always beautiful, get lost in the magic, get lost for days up and down its slopes and streets, sleep in a sleeping bag, soak in reality – like a swimmer in the water – and let nothing conventional distract you. Let your feet guide you, slowly, as if you were cured by the pleasure of looking, humming, and what you will see you will start photographing more carefully, and you will learn about composition and framing, you will do it with your camera, and your net will be filled with fish when you arrive home. Learn about focus, aperture, close-ups, saturation, shutter speed. Learn how to play with your camera and its possibilities. Collect poetry (yours and that of others), keep everything good you can find, even that done by others. Make a collection of good things: like a small museum in a folder. Photograph the way you like it. Don’t believe in anything but your taste, you are life and it’s life that chooses… You are the only criterion. Keep learning. When you have some good photos, enlarge them, make a small exhibition or put them in a book and have it bound. Showing your photographs will make you realize what they are, but you will understand only when you will see them in front of others. Making an exhibition is giving something, like giving food, it’s good that others are shown something done with seriousness and joy. It’s not bragging, it’s good for you because it gives you feedback. That’s enough to start. It’s about vagabonding, sitting down under a tree anywhere. It’s about wandering in the universe by yourself: you will start looking again. The conventional world puts a veil over your eyes, it’s a matter of taking it off during your time as a photographer.